These photographs first appeared May 23, 2000. Send your photographs for inclusion in this rotating gallery! This 28-year old specimen of Classic Whale(r) was revived after suffering several 2-inch holes to her ventral surfaces. The therapy: West System, Awlgip, and TLC. 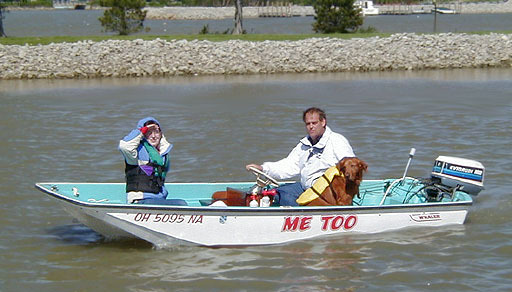 Now she looks beautiful, carrying dad, daughter, and dog on the fresh water of Marblehead, Ohio. "The interior blue does not look nearly as blue in the pictures as it really is," says restorer Buck Stinchcomb. 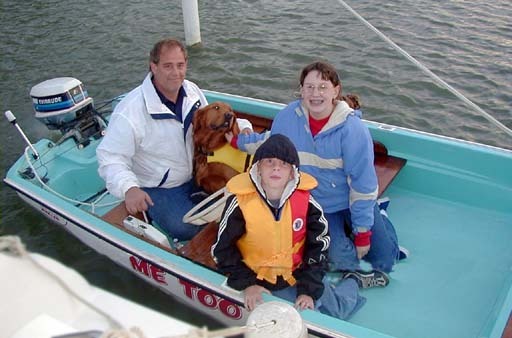 Want to get your kids involved in boating? 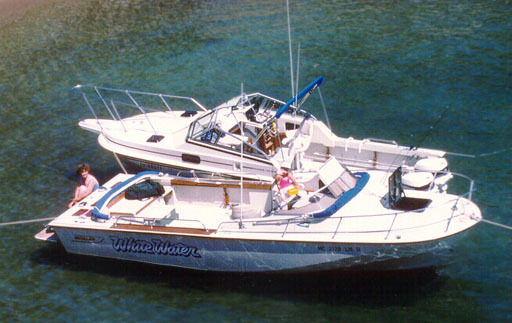 Take them out on the water in a Classic Whaler. Even the dog wants a chance at the helm! Don't let him scratch that beautifully restored original Philipine mahogany interior! The aquamarine water of the North Channel's Benjamin Islands provides the setting for this mini-rendezvous of two interesting Whale(r)s. Don McIntyre's WHITE WATER, is an 25 Revenge Cuddy with rare 260 MerCruiser I/O propulsion. This model combines the forward cuddy of the Outrage Cuddy with the fixed windshield and dual console helm of the Revenge, hence the REVENGE CUDDY model. The open cockpit is huge. 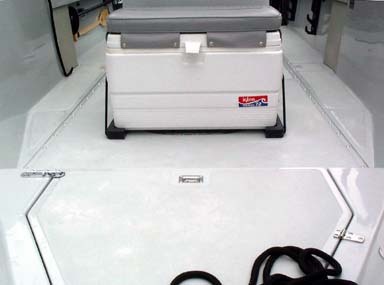 Custom canvas includes a full headroom camper top with screened side curtain which connects to the flying top, enclosing the area. Rafted with it is Walt Steffen's Revenge 22, powered by twin Johnson V-4 110 HP non-counter rotating outboards. You can see by the angle of this photograph that there are some rather tall rocks nearby. The other thing I notice is that all the Sun Tops are stowed even though everyone is sitting in direct sunlight. Remember, the North Channel is closer to the North Pole than it is to the Equator! Up there, a little warmth from the sun feels darn good in August. 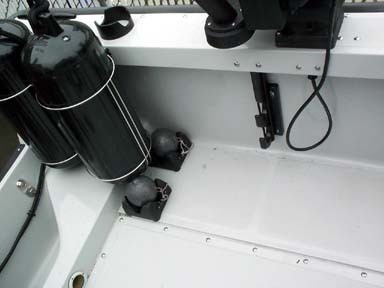 Louie Kokinis sent some close-ups of his big Whaler 22 Guardian, a boat from the Commercial Division of Boston Whaler which he has rigged for offshore fishing. By the way, I usually show all the Cetacea photographs to my wife, Chris, to get her opinion of them and to gauge her reaction. After looking at these Guardian 22 shots, she said, "That is definitely a man's boat." This boat has a huge bow locker. A large cooler/seat combination is mounted in front of the console. 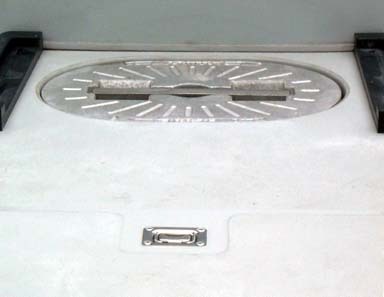 Note the latch securing the hatch. The unobstructed floor has no compartment covers to rattle. Remove the cooler and you get access to the big Bowmar Hatch. Commerical grade components like this are very sturdy. Note the cooler cleats fabricated from black "Whaler Board". Looking forward from the transom, the deep interior of the Guardian is evident. The rear of the leaning post houses a built-in tackle box. Note the drain hole. How many screws does it take to hold down the cockpit floor on a Guardian 22? Attention to detail creates this neat mouting of fenders and downrigger weights. 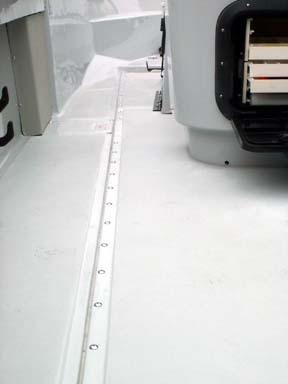 The weights are on the cockpit floor for rough water or trailering; otherwise they're on the gunwales next to the Scotty electric downriggers. 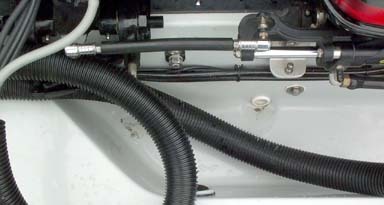 Dual Racor filters fed from independent tank pick-ups keep the engines (225 HP main and 15 HP aux.) running smoothly. Paddle and stern light are stowed on the bulkhead. 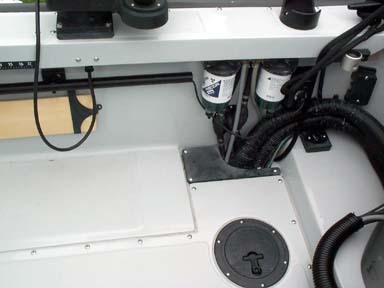 Main and Auxillary engines are easy to link for steering, even in rough water.